Try AutoTURN Rail. Inquire about the free trial today. 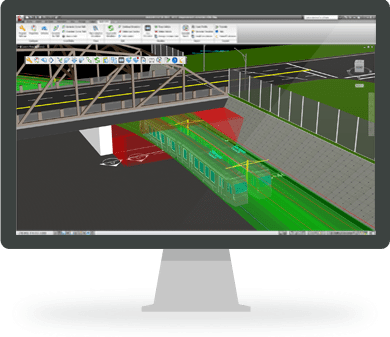 AutoTURN Rail takes all the guesswork away and allows designers to explore more what-if scenarios without adding extra design time. Conflicts are highlighted and corrected in a fraction of the time the manual process requires. You have successfully registered for the trial evaluation of AutoTURN Rail. A product advisor will contact you shortly with further instructions regarding your evaluation copy of the software. Thank you for your interest in evaluating AutoTURN Rail. The software is fully functional and allows you to see first-hand how it can help increase your productivity and efficiency while producing reliable results. By requesting the evaluation you accept this software program for the purpose of evaluation only. Any use of the software on commercial projects is to be strictly limited to your evaluation of this software. The contents of the program remain the property of TRANSOFT SOLUTIONS, INC. The evaluation period will extend over a period of 30 calendar days.